At 8 meters wide and 4 meters deep this is a large garden gym building by Garden Fortress. Once you add in the space of the veranda that runs along the front of the building and the covered seating area at the side, the building sits on a footprint of 10m x 5m. If you are looking for a fully insulated workshop which will be a comfortable place to work all year round, you’ll want to talk to Garden Fortress. They have recently completed this 5m x 4m workshop with storage, in Wimbledon SW19. Garden Fortress created this 4m wide by 5m deep building as a home office and showroom for a furniture designer. Based on their Classic Garden Studio Range, the customer was able to tailor the design and finishes to their own tastes. Garden Fortress are adept at designing garden rooms that have two uses under the one roof. This example in Balham is a playroom for the kids with secret bike store. Incorporating more than one set of doors into a garden room can be a practical design choice, but can also create a free flowing, airy space. 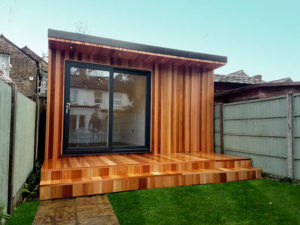 If you want to incorporate a toilet into your garden room or office but don’t want the expense of the extensive groundworks to connect it, why not consider an eco toilet. Garden Fortress have recently completed another garden office building with secret storage area. This build was in Kingston Upon Thames and sits on a 4m x 4m footprint. The team at Garden Fortress have become quite adept at designing garden rooms with hidden storage sheds. With this recent example, you’d never know there was a storage area within the building when looking at the building from the front. Most garden rooms with secret shed have the main room and shed area side by side. Another option, particularly if you have a long garden is to hide the shed behind the garden room.